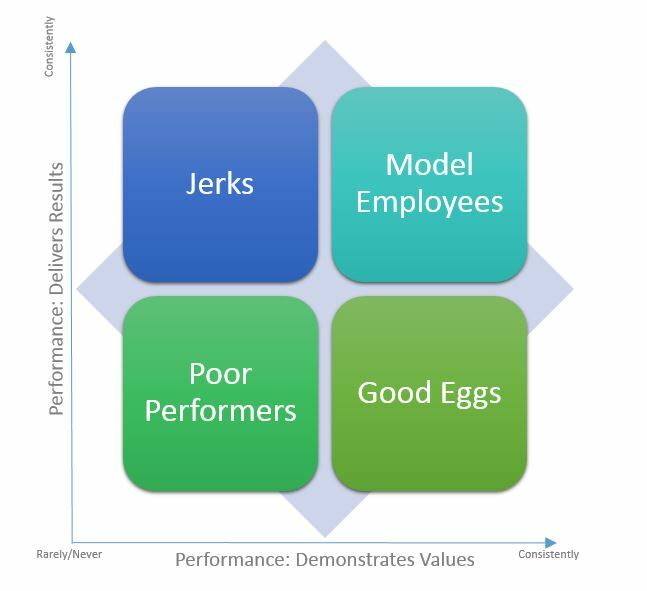 Recently, Jack and Suzy Welch posted an article on LinkedIn titled “Do You Have a Jerk Problem?” In the article, they talk about 4 types of employees relative to their performance and behaviors, one of them being the “Jerk.” The article stops just short of what managers can do to address the “Jerk Problem.” The Welches define “performance” as delivering results, and this is one point on which I will respectfully disagree with this article. Performance is as much what you achieve (results) as how you achieve it (behaviors). This key belief is one that will help managers address their jerks. As stated in the Welch article, the Jerks all too often go unscathed, while continuing to negatively affect those around them. We accept bad behavior because they consistently deliver results. We fail to call them on their jerkiness, often to the detriment of impacting the engagement level, and yes, the ability, of others to deliver results. We do this because we were all trained to link behavioral problems back to business results – and because they are delivering consistently, it’s really tough to do this. Case in point: I was talking with one of my friends over the weekend about a situation at her workplace, made up of a close knit team of six employees. They finally let someone go, affectionately known as “Eeyore” to her co-workers. Eeyore’s results were always really good, but her behavior was really negative. She worked there for EIGHT YEARS – with the same behavior. She was finally terminated for attendance a couple of weeks ago, and my friend has noticed a marked difference in her workplace. She said that it’s been a much more positive work environment, other co-workers have let her know that they have noticed a positive difference, everyone is happily pitching in to cover the work in the short term (the delivery driver is even filing! ), and my friend said that she doesn’t dread going in to work anymore. So, what’s a good manager to do? As the Welch article states, you just can’t look the other way, but it stops short of offering advice on what to really do about it. I’m going to go out on a limb and say: “It’s OK not to allow bad behavior in the workplace!” It’s OK, as long as you do this consistently for all employees. It’s OK as long as those standards of behavior are clear, and when they are you can treat them as poor performance, just as you do when someone isn’t delivering business results. Most businesses have a set of core values that define how you’ll do business. Wood Consulting’s core values are growth, partnership, and making a difference. Now, as a sole proprietorship, I have a big problem if I’m not behaving consistently with my values. I think it’s fair to say that all kinds of jerky behavior can be linked to being in conflict with core values. Salesperson being rude or arrogant to the customer service rep or shipping department? That’s a failure to demonstrate partnership. Production refusing to listen to marketing’s explanation of the changing needs of the customers? Failure to demonstrate partnership, failure to grow individually through learning and failure to support the growth of the organization. Maintenance tech refusing to share what he knows about how to fix a particular piece of equipment with other techs? Failure to support growth of others and the organization, failure to display partnership, and failure to make a difference on the long term success and sustainability of the organization! By failing to address bad behavior, managers are sending mixed messages to the rest of their team and setting the tone that the values of the organization are just words on paper. Those impacted by the jerk’s bad behavior feel that they are not valued by the manager or the organization in general. Employees that don’t feel valued often stop delivering results to their full potential, and depending on the reach of the jerk’s interaction with others, that could be a significant impact on the overall success of the organization. The bottom line is, jerks need to be addressed. You can’t afford not to! Wood Consulting Group‘s mission is to partner with small to mid-sized businesses and non-profits to help them stand out of from the pack and optimize their workforces through training and development, strategic planning processes, employee engagement, succession management, performance management, coaching, and supplemental human resource activities. Wood Consulting was formed upon realizing a link between the founders’ passion for making a difference in organizations and communities and the need for personalized support for small and mid-sized businesses and non-profits. Our vision is to be a true partner that helps organizations identify and achieve their goals more quickly, reaching higher levels of success. Wood Consulting represents the last name of the founders, Jennifer and Ed Wood. It also represents their passion for workforce optimization and organizational differentiation. Workforce optimization is really just that – getting the absolute best effort and results from the workforce of the organization – whether that means improving engagement levels, analyzing recruiting processes to ensure the best fit from the get-go, enhancing their skills through training and coaching, or evaluating the organizational structure. Organizational differentiation means helping organizations be the best and stand out from the crowd in ways that are meaningful and important to achieving their specific goals. This will take on a different meaning for different organizations – based on the market within which they are competing, existing culture and values, and strategic direction for the organization. All of the services that Wood Consulting offers tie back to these two basic principles in some way. Contact us by email at woodconsultgroup@gmail.com or phone at (608) 921-2223 to learn more about any of the services offered.